Rotor Outside Diameter (in) 13.187 in. Rotor Thickness (in) 0.713 in. The slots on the Power Stop slotted rotor are engineered to reduce brake fade by providing an escape path for the gasses emitted from the brake pads under extreme braking conditions as well as dispersing built-up heat. 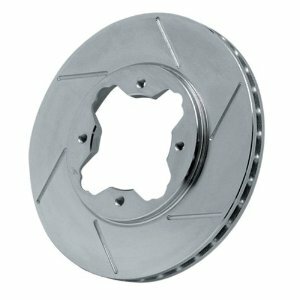 In addition to the de-gassing and cooling benefits, the Power Stop slotted rotor design improves braking under wet conditions as the water is swept through the slots and keeps the pad surface clean, which reduces brake dust. Each rotor is coated with a shiny, silver zinc dichromate finish to prevent corrosion and maintain the new rotor look. Power Stop slotted rotors can be used with the original braking system; a big brake kit is not required.